20 Trail Rider Dirty Santa Toy Run By Rich Pelkowski Coal Country— It's 7 a.m., barely 20 degrees and breezy at the Darkwater staging area for the first-ever "Dirty Santa Toy Run." Brrrrr, who the heck selected this date? Well I blame it on Marco Sanna. But if it weren't for him coming up with this idea just five weeks earlier, and pushing a handful of Dela- ware Valley Trail Riders club members to pull off this event, it certainly would've never happened. Well we've at least got a few tables, one or two easy-ups, and fortunately a REAL MARINE had the sense to bring a small tent with sides lest we'd all perish due to the elements. We made a go of it. Man were we green! And by the me we were packing up the last of it by dusk, the wind-driven snow that started about mid-day now coated the open trails and surrounding hills. The first event in 2016 was kind of last-minute planning with minimal promo on. Pre-reg numbers indicated a endance at about 85. Surprisingly it ended up being about 230 rid- ers with more than 250 toys collected for the TFT program! Fast forward to 2017; be er promo on, more tents, more food and we had nearly 480 riders pre-registered. Another 400-plus showed up to register the day of the event and we clocked about 900 riders and about 1300 toys collected, including a few bicycles. We filled 48 large TFT boxes, not including the bicycles and other toys that didn't fit! Our local TFT Marine Reserve guy removed our "Rookie" status, sta ng that we had collected more toys than anyone in his program. 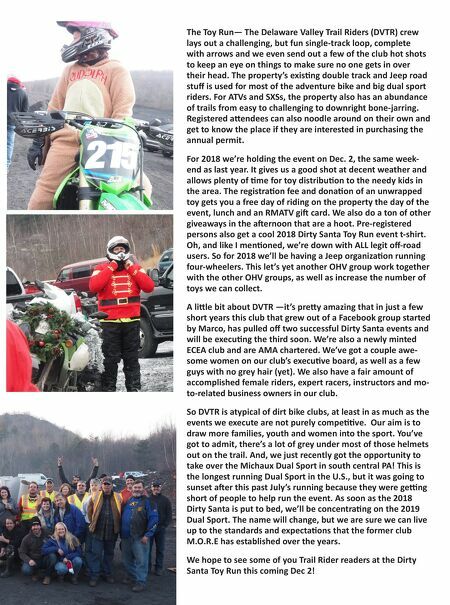 Just shows how people step up for one of the best-run and effec ve chari es out there —The Marine Reserve "Toys for Tots" program. 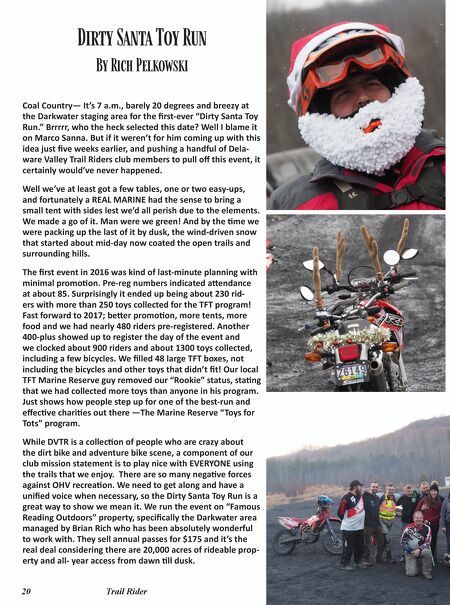 While DVTR is a collec on of people who are crazy about the dirt bike and adventure bike scene, a component of our club mission statement is to play nice with EVERYONE using the trails that we enjoy. There are so many nega ve forces against OHV recrea on. We need to get along and have a unified voice when necessary, so the Dirty Santa Toy Run is a great way to show we mean it. We run the event on "Famous Reading Outdoors" property, specifically the Darkwater area managed by Brian Rich who has been absolutely wonderful to work with. They sell annual passes for $175 and it's the real deal considering there are 20,000 acres of rideable prop- erty and all- year access from dawn ll dusk.